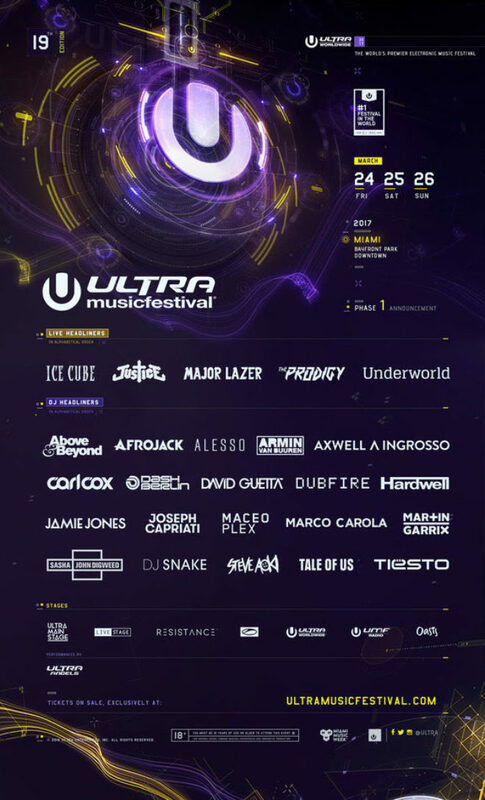 Ultra Music Festival will return to Miami's Bayfront Park next year, running for three full days from 24th - 26th March 2017. There's something for everyone on this year's line-up, with key figures from the underground and EDM worlds set to collide across Ultra's many high-spec stages. Above & Beyond, Afrojack, David Guetta, Hardwell and Alesso will be representing for EDM lovers, whilst the techno-orientated Resistance stage will take over two areas for the first time this year. Marco Carola, Joseph Capriati, Jamie Jones, Carl Cox and Dubfire are all signed-on to spin across the three-days, alongside live acts including Justice, Underworld and The Prodigy. Check out the full line-up below alongside the aftermovie from Ultra 2016 below. Tickets here.